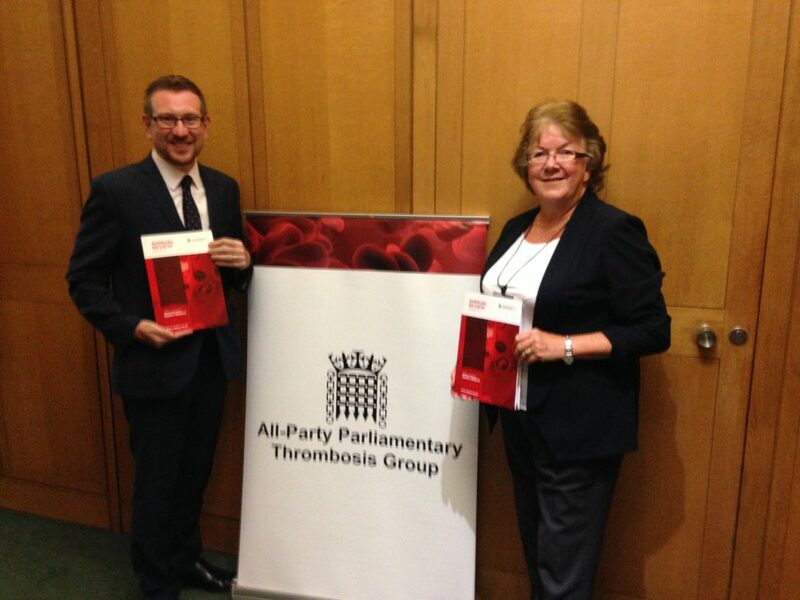 The All-Party Parliamentary Thrombosis Group held its Annual Conference on Thursday 29th November 2018, which was attended by over 100 delegates from a broad range of clinical and charitable backgrounds. 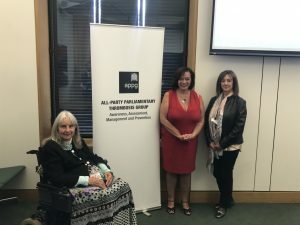 The conference was chaired this year by Lyn Brown MP, Chair of the All-Party Parliamentary Thrombosis Group and the Member of Parliament for West Ham. In her opening address, Lyn gave an overview of the key findings of the Annual Survey Report, highlighting that although a number of VTE management and care practices are now firmly established, there are concerns that some of these standards are slipping, highlighted by the drop of 1% in the number of VTE risk assessments undertaken from April 2017 to March 2018. A copy of the full report can be downloaded here. There were three key presentations on the day from a range of experts from across the VTE care and management landscape. Attendees first heard from Professor Beverley Hunt, Professor of Thrombosis & Haemostasis at King’s College London and Medical Director of Thrombosis UK on the topics of adherence to the NICE guideline on VTE risk assessments and thromboprophlyaxis use. In her presentation Professor Hunt highlighted that there was some confusion across the NHS as to which risk assessment model should be used and why the new NICE guidelines were seen as controversial and often not adhered to. Attendees heard next from Kieron Power, Lead VTE Clinic Pharmacist at Singleton Hospital. His presentation gave an informative insight into Cancer Associated Thrombosis (CAT) and how the care the patient receives can be improved. An important aspect of this was raising awareness of CAT in all cancer patients using a range of materials such as patient leaflets and videos. Eve Knight, Chief Executive of Anticoagulation UK, concluded the presentations by giving an overview of the charity’s recently published Out of Range report, which focused on anticoagulation management in secondary care in England based on an audit of NHS Trusts. A key finding was that only 38% of responding Trusts said they provide more than leaflets to patients to support their understanding of AF and adherence to treatment. Following the presentations, Lyn Brown invited Frances Akor, consultant pharmacist at Imperial College Healthcare NHS Trust, Rebecca Chanda, highly specialist pharmacist (anticoagulation safety) at Guy’s and St Thomas’ NHS Foundation Trust and Janet Davies, joint clinical lead of the Liverpool Anticoagulation Service on to the stage, as well as welcoming back Professor Beverley Hunt, Eve Knight and Kieron Power. There were energetic discussions on a range of topics, including the variation between CCGs in the ways in which they recorded and monitored how VTE risk assessments were undertaken. Questions were asked regarding how this could be unified to ensure that VTE risk assessments, which were an important topic on the day, were maintained. There was also interest in the figure from the annual report that although 90% of CCGs clearly mandated that failure to comply with best practice in VTE prevention will result in consequences imposed by the CCG, sanctions were rarely, if ever, brought against Trusts failing to undertake or record VTE risk assessment. The conference concluded with Lyn opening the floor to the attendees, giving them a chance to network with the other guests and discuss additional topics with the expert panellists. Plans are now underway for our programme of activities for 2019, and Lyn Brown urged attendees to write to their MPs and relevant charities to ensure that the momentum generated by the annual conference is maintained as we move into 2019. The slides from the meeting can be downloaded here. 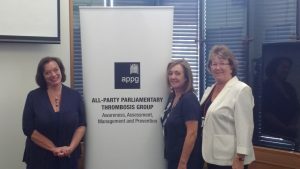 The APPTG held its AGM on 11th July 2018. Lyn Brown MP was re-elected as Chair. Andrew Gwynne, Baroness Masham and Sir David Amess were re-elected as Vice-Chairs, and Lord Haworth was re-elected as Secretary. Attendees also discussed the group’s successes and plans for the rest of 2018 and into 2019; the full minutes of the meeting can be downloaded here. 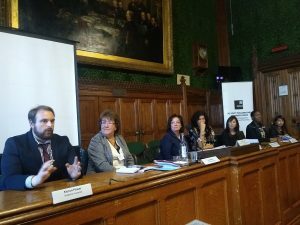 The APPTG’s flagship event, the Annual Conference, took place in Parliament on Thursday 30th November 2017. This year’s conference was chaired by Professor Roopen Arya, the National VTE Exemplar Centres Network Lead, standing in for APPTG Chair Lyn Brown MP. Attendees heard from Dr Peter MacCallum, the UK National Co-ordinating Investigator of the GARFIELD VTE Registry. GARFIELD VTE is providing a contemporary global picture of the patient characteristics and management of VTE. Potential links between rising obesity in Britain and VTE were of particular interest to attendees. Attendees next heard from Graeme Kirkpatrick, Head of Patient Safety (Advice & Guidance) at NHS Improvement, on the current national patient safety initiatives in VTE. NHS Improvement has now taken over responsibility for patient safety, and is planning to link the various national datasets on VTE to better identify patients at risk and develop policy accordingly. Graeme also noted that the Healthcare Quality Improvement Partnership (HQIP) is exploring the feasibility of a national clinical audit on VTE prevention. Attendees also heard from Helen Williams, Clinical Associate for Cardiovascular Disease at Southwark CCG, on delivering excellence in VTE anticoagulation services. Helen emphasised the importance of keeping patients involved in service design, and urged providers to seek input from patients and their carers on what they would like to see incorporated into services. Following guest presentations, Roopen Arya moderated a panel discussion with leading exemplars of VTE best practice. This included Simon Toh, of Portsmouth Hospitals NHS Trust; Dr Susie Shapiro, of Oxford University Hospitals NHS Foundation Trust; Andrea Croft, Abertawe Bro Morgannwg University Health Board; Louise Hill of GP Care; and Anticoagulation UK’s CEO Eve Knight. Patient support was a key theme in the discussion. It was noted that VTE can be a very isolating experience, and that it is important for patients to know that they are not alone. The panel discussed how patient support groups, such as the one provided by GP Care in Bristol, can provide this reassurance while empowering patients to manage their condition. There was also much discussion on the occurrence of hospital associated thrombosis (HAT) in patients receiving thromboprophylaxis. The APPTG’s Annual Review found that one in six cases of HAT occurred in patients already receiving thromboprophylaxis, and it was suggested that the true figure could be as high as 50%, given ascertainment biases in HAT reporting. Panellists discussed the importance of root cause analysis in identifying the patterns in patients that failed thromboprohylaxis, and it was argued that reassessment of patients can be even more important than the initial risk assessment. The conference was wrapped up with a reminder that as the NHS develops new models of care and the traditional boundaries between secondary, primary and community care dissolve, the need for a robust approach to VTE prevention and management in all areas of care is as profound as ever. The APPTG held its AGM on 13th September 2017. After seven years as APPTG Chair, Andrew Gwynne MP stood down and Lyn Brown MP was elected as the new Chair. Andrew Gwynne was then elected as Vice-Chair, Baroness Masham and Sir David Amess re-elected as Vice-Chairs, and Lord Haworth re-elected as Secretary. Plans for the rest of 2017 and into 2018 were discussed; the full minute of the meeting can be downloaded here. The APPTG held its Annual Conference on Thursday 1st December 2016. The conference was well attended by over 120 delegates representing a broad range of organisations. An expert panel delivered presentations on a range of topics from VTE in care homes to the present rate of hospital associated thrombosis in the UK. This was followed by an engaging question and answer session which focused on improving VTE prevention. The APPTG’s Chair, Andrew Gwynne MP, lead the first half of the conference and Professor Roopen Arya (Director, King’s Thrombosis Centre, VTE Exemplar Centre Network) chaired the question and answer session. The presentations from the Annual Conference 2016 can be downloaded here. Of the patients who died of cancer between 2012 and 2015, 2.5% also had VTE listed on their death certificate as a cause of death. This accounts for an average of 4,047 deaths per year during this period, peaking at 4,224 deaths in 2015. The average annual increase in cancer deaths in which VTE is also a cause of death is over four (4.45) times higher than the average annual increase in overall cancer deaths. Death rates for patients who died of brain, lung and bladder cancers – where VTE was also implicated – were particularly high at 2.9%, 2.9% and 2.5% respectively (in 2015). Only one in three NHS Trusts (35%) have a dedicated policy or pathway for the management of suspected VTE in patients receiving chemotherapy. 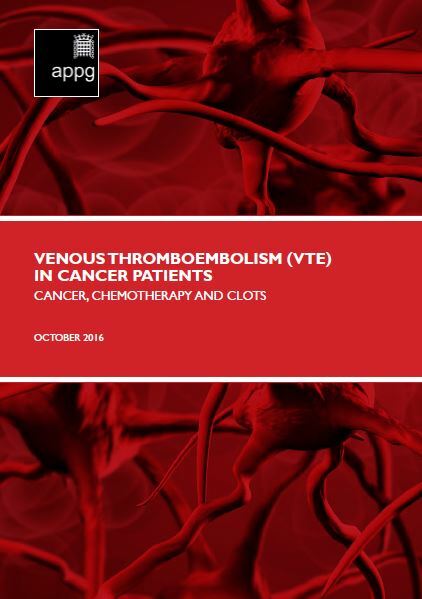 Across all regions, just under half of Trusts (44%) are providing patients with both written and verbal information about the risk of developing VTE during chemotherapy; what symptoms to look out for and what action they should take if they suspect a Deep Vein Thrombosis or Pulmonary Embolism. On average, 2.4% of cancer patients in England were also diagnosed with VTE each year between 2012 and 2014; this is higher than previously estimated. The incidence rate of VTE in cancer patients varies by region; the South of England region has an incidence rate of 2.2% and the North of England has a significantly higher rate of 2.6%. 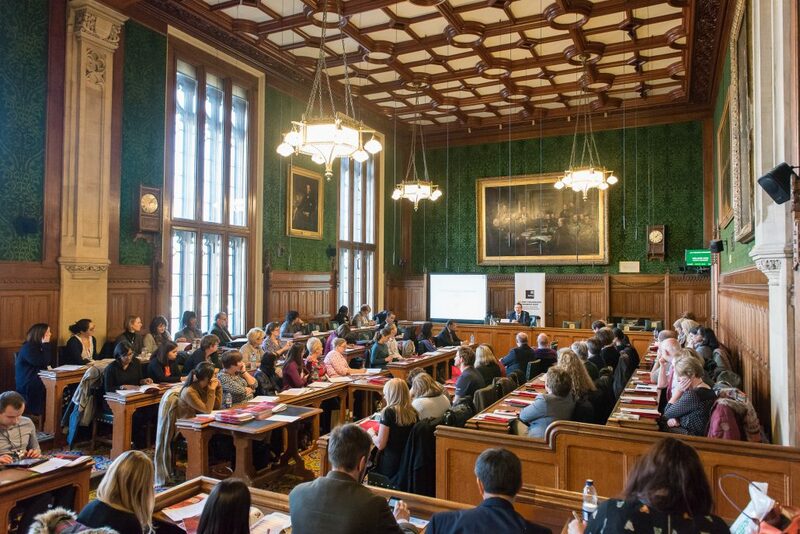 Attendees also heard from Dr Simon Noble, Medical Director (Wales) for Thrombosis UK on why cancer patients are at risk of VTE, and Professor Annie Young, University of Warwick, on the Cancer Associated Thrombosis White Paper presented to the European Parliament on World Thrombosis Day (13th October 2016). The discussions at the roundtable meeting informed the recommendations of the 2016 update of the APPTG’s VTE in Cancer Patients report. The APPTG held its AGM on Tuesday, 10th May 2016. Elections for the group’s officers were held, in which Andrew Gwynne was reconfirmed as Chair; Lyn Brown, Sir David Amess, and Baroness Masham were reconfirmed as Vice-Chairs; and Lord Haworth was reconfirmed as Secretary. Andrew Gwynne gave attendees a summary of the previous year’s work and outlined the APPTG’s 2016 plans. Eve Knight, Chief Executive of AntiCoagulation Europe (ACE), then gave attendees an update on the work of ACE. Anticoagulation UK pays Four Communications to act as the group's secretariat from grants received from the BMS-Pfizer Alliance and Bayer. For further information, or to join the APPTG’s mailing list, please contact Robbie Toomey, APPTG Secretariat at robbie.toomey@fourcommunications.com or by phone at 020 3761 4451.